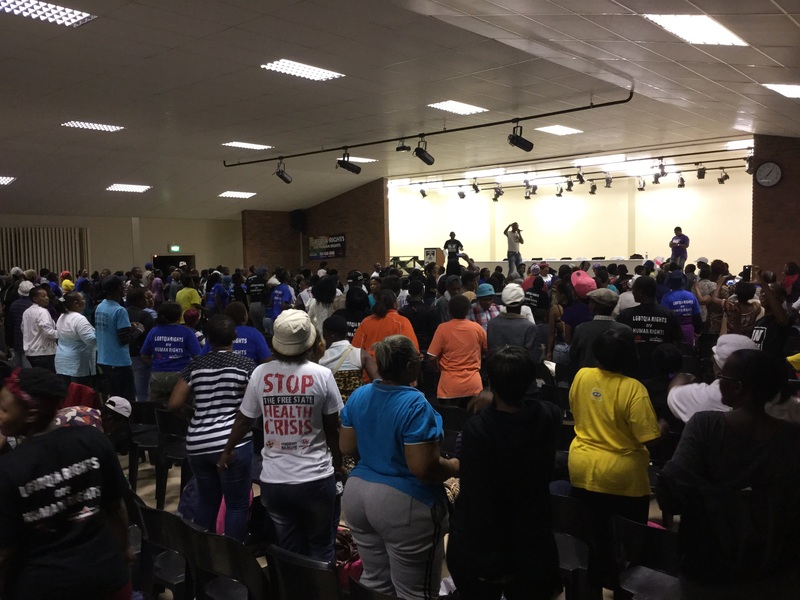 It was 6am on a Sunday morning, and I was in a car with three Section27 workers, rapidly awakening as we hurtled down the highway away from Johannesburg, and toward Bloemfontein in the Free State province. 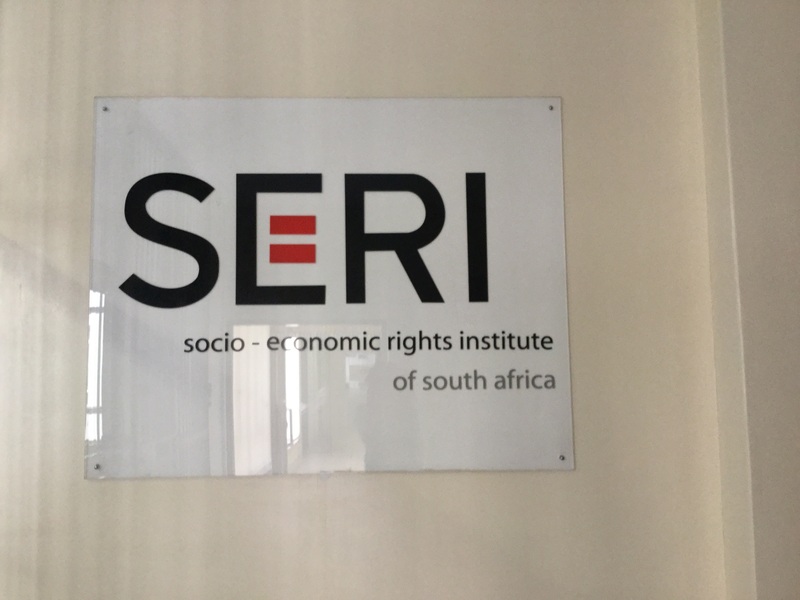 Section27 is a legal advocacy organisation that aims to use the law to advance the achievement of the rights to healthcare, food, water and social security enshrined in section 27 of the South African Constitution. 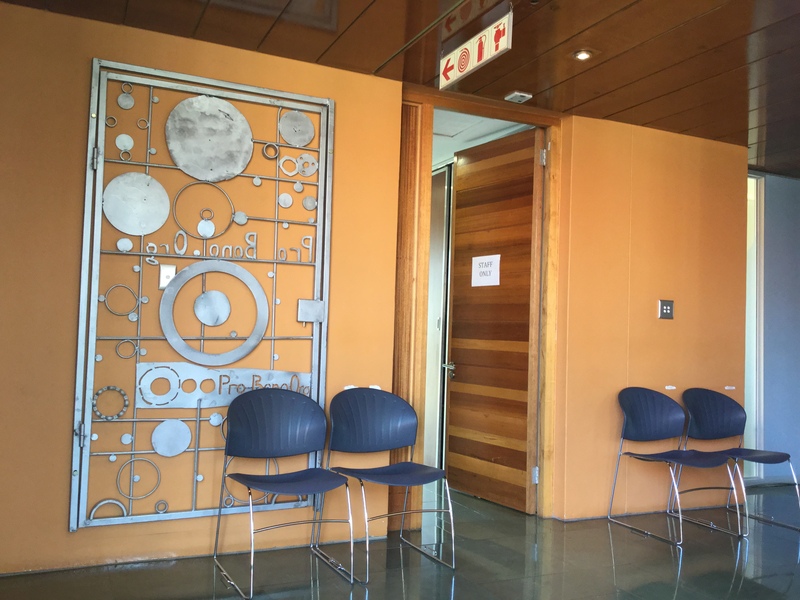 It had kindly invited me to observe the trial of approximately 120 of its (black) community health worker clients at the Bloemfontein Magistrates’ Court the next day, Monday 30 March 2015. The workers had initially been charged with “prohibited gathering”, and associated charges, under the Regulation of Gatherings Act 1993. 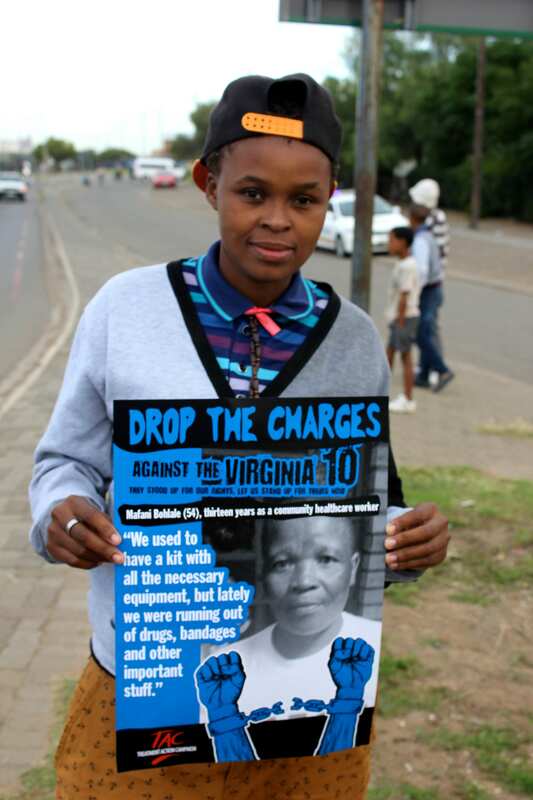 I was told these charges related to a peaceful vigil the workers had held at the Free State Department of Health on 10 July 2014, after they had been laid off with no reasons given. I was also told that the only evidence the prosecution had against the clients was six affidavits of police who had attended the scene, all of which confirmed that the gathering had been peaceful. This case was devastating for many reasons. There was the workers’ ignominious dismissal, for one thing, and how it demonstrated a dismal lack of labour rights protections. 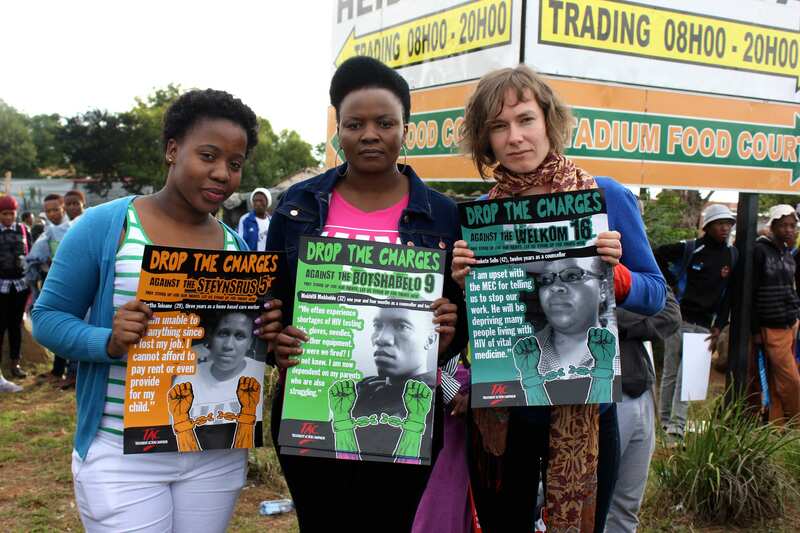 That the workers had been charged under an apartheid-era law was another, and how this sat uncomfortably with the Constitutional right to peaceful protest. Many of the dismissed workers were older women who had been in their roles for many years, and so through their dismissal the health sector had not only lost a wealth of experience; it had also caused many workers to lose what may have been their last opportunity at gainful employment. And, perhaps most importantly, the health sector was down 120 health workers to assist South African HIV and/or tuberculosis sufferers. Something I had not previously known about South Africa was the extent of its HIV epidemic. It is said to have the largest HIV positive population in the world: 6.1 million people in 2012, of a population of about 53 million, with only a small amount of those people receiving access to antiretroviral medication. As we drove along, I was told about how this case was part of a broader campaign to improve the South African health system and support community health workers, in which Section27 collaborated closely with the Treatment Action Campaign (TAC), a 17-year old campaigning organisation that worked to assist those providing access to AIDS treatment. After four hours we arrived at our destination, and the others went to attend to a TAC National Conference, while I awaited that evening’s night vigil. Many health workers had traveled to attend the hearing from all around the country, and they were going to stay together in a church hall on the outskirts of town. To prepare for the trial, they would hold a vigil there that would last much of that night. We arrived at the night vigil at about 6.00pm to a circle of hundreds of dancing, singing bodies in a garishly lit hall full of plastic chairs and an immensity of spirit. Many of those dancing proudly wore HIV Positive t-shirts, or LGBTQIA Rights are Human Rights t-shirts. We expecting matters to be delayed, so I went outside to help cut carrots in the dark, part of a meal that would later feed the approximately 500 people in attendance. At 8.30pm, the singing mounted, and we all stood from our chairs. The songs that were being sung, Violet of Section27 told me, were the “songs of the struggle“.”Amandla“, the crowd roared. “It means power“, Violet told me. And “awethu” meant “to the people“. As time passed, I wondered whether the core business would begin shortly. And then, when it didn’t, I sat quietly, humbly, alongside that somewhat pleasant growing pain of stretching patience. 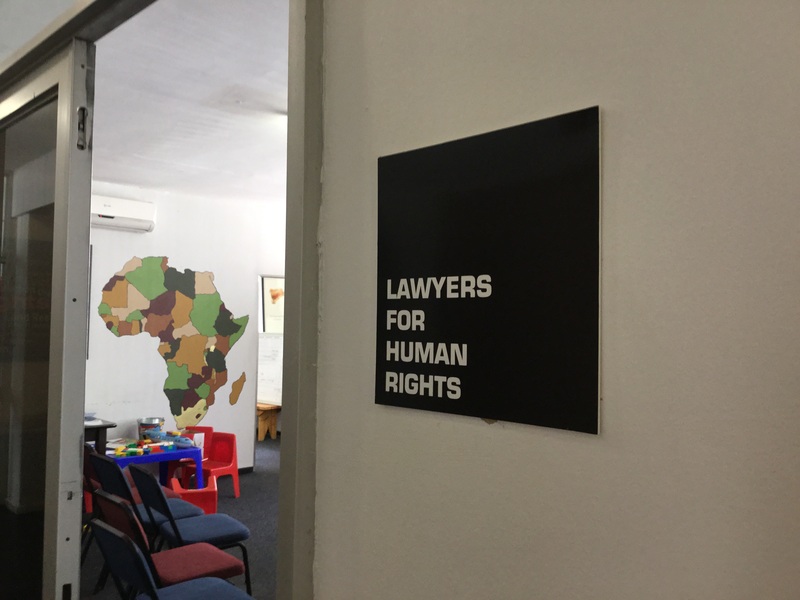 Close to 9.00pm, Mark Heywood, Executive Director of Section27, rose to address the crowd on what to expect of the trial tomorrow, and to arrange to confirm instructions with the clients on how to proceed. The logistical complications of seeking instructions from such a large group were evident as the clients huddled together in a caucus. It was eventually decided that, if possible, the clients would seek to proceed to trial tomorrow. The chants and singing then began again. “Amandla“. “Awethu“. “Viva for community workers“. “Jobs“. Strength“. “Justice“. We left close to 1.00am, after Violet had addressed the crowd on the national campaign of health workers she was coordinating. While many conversations looked like they would continue into the night, as we walked out many were starting to wrap themselves in blankets, or fall asleep on the floor. We awoke at 6.30am to meet the group at 7.00am outside the Pelonomi Private Hospital, and march to the Magistrates’ Court. 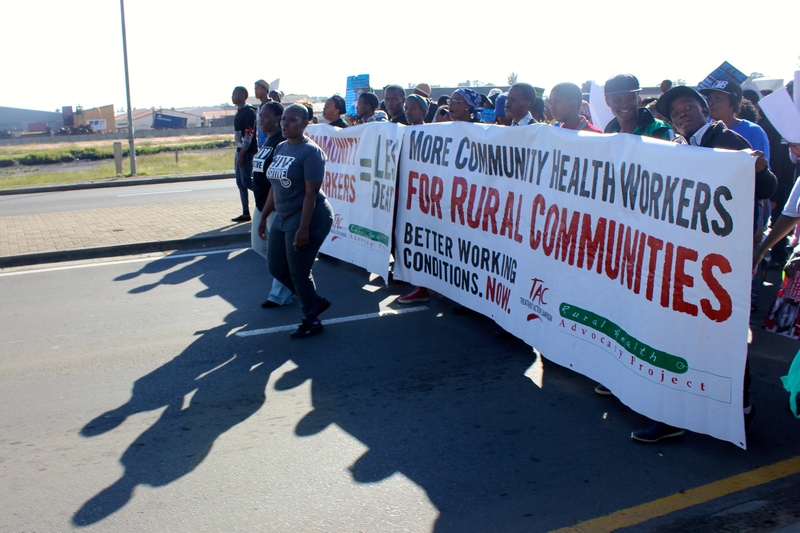 We walked slowly, escorted by police, dancing and singing: community health workers, their supporters, TAC, Section27, all marching together. Of the four white people present, all but one was a foreigner. We arrived at the Magistrates’ Court at about 9.00am, to an update from Mark of Section27 that the prosecutor had not arrived as he had double-booked himself, and that the Magistrate had said that the matter was listed for an appearance, not trial, despite court papers to the contrary. It all seemed Kafkesque, surreal. There was nothing to do then but wait. We were a group of a few hundred strong standing in the sun outside a courthouse, singing in small groups, with a little more trepidation now. Then, a few hours later, another update – the prosecutor was ready to proceed. But now the Magistrate had other matters to attend to, and this would take last priority. Time passed, and I chatted with whomever would have me about the campaign and the state of the health system in South Africa. I was told many stories about a health system in crisis. 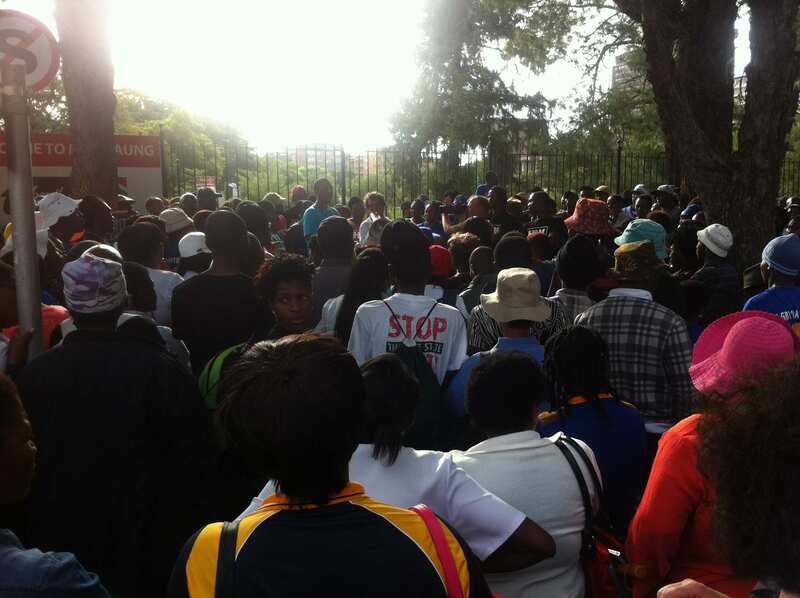 HIV positive patients who were turned away from health services; a public hospital that had no operations for a week, because the roof had collapsed on an elevator going to Intensive Care Unit on the fourth floor; rats scampering through the hallways of some hospitals, disastrous surgery stuff ups in others. When asked about where the opportunities lay for advocacy work in this area, one campaigner answered with another question: “but…where do you start biting an elephant?” Would he enter politics?, I asked. It makes people too corrupt, he responded. At about 1.30pm, we were told the trial would commence at 2.00pm. 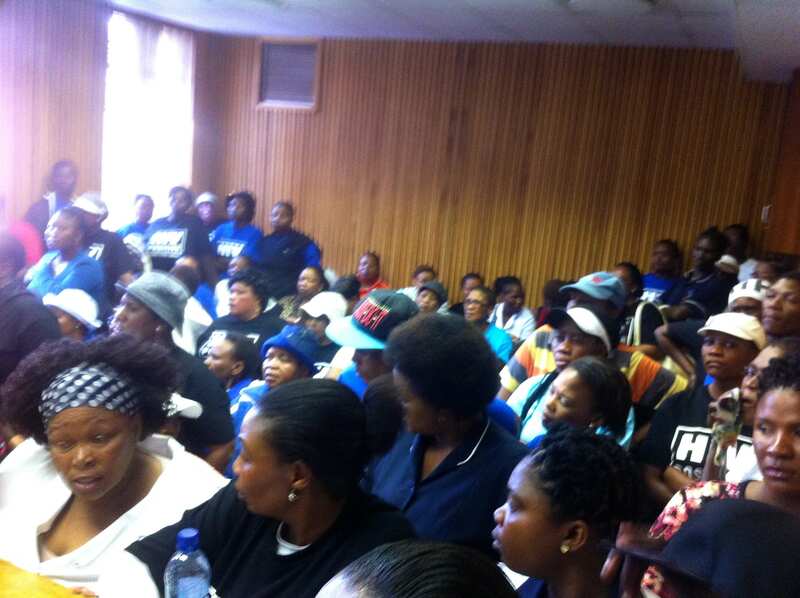 And so a little before 2.00pm, 118 community health workers (two, it later emerged, were absent), their counsel and lawyers, a journalist, and me, crammed into a room perhaps 10 by 5 meters. There was no room for spectators. There was no room to breath. Eventually the prosecutor and Magistrate arrived and we were ready to begin. Shortly afterwards one of the accused fainted from the heat, and had to be taken outside. Upon recommencement, counsel for the accused made an application to have the charges quashed on a technical basis: that the charge sheet had been amended twice, but, despite numerous requests from the accused’s representatives for particulars, continued to lack sufficient specificity to satisfy the requirements of the Criminal Procedure Act. He also argued that the Act itself was inconsistent with article 17 of the Constitution. The Magistrate did not seem to accept either submission, more concerned with the absurdity of trying 120 accused simultaneously in a room equipped for a maximum of four. Eventually, Her Honour ordered that the matter be set down for a five-day trial commencing 6 July 2015, and stated on the record (although curiously did not make any case management orders, given the prosecutor’s contumacious history) that the prosecutor was not to double book himself, and was to consider how the matter was to proceed given the impracticality of the status quo. The court did not seem to regard itself as having a role to play in making these arrangements, although I imagined it knew best the capacity of its own facilities. The crowd emerged from the courtroom a little after 3.00pm to a final debrief by Mark on what would happen next. There was more singing before we disbanded, but it had been a long day, and people were starting to look tired. I got the sense that to return here again for a five-day trial would be burdensome for many, particularly mothers, the elderly, and those who were unemployed and/or lived in remote areas. Having worked in the Supreme Court in Victoria many years ago, I now saw its case management processes (including the use of directions hearings, and procedural orders), its technological facilities (including video conferencing), and its competent Registry in an entirely new light. The experience affirmed the importance of both good court administration and prosecutorial conduct, not just for its own sake, but also for the sense of justice being done. 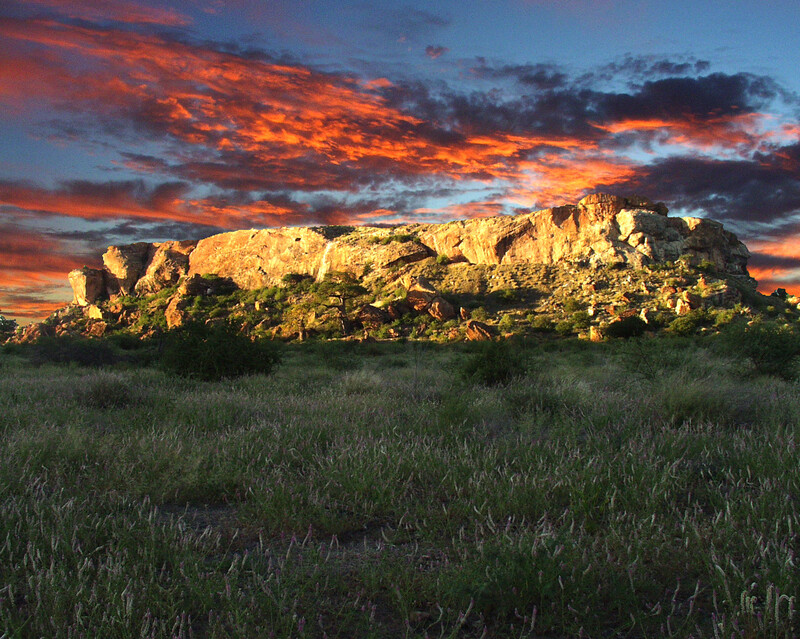 And as the sun started to set on the day, we prepared for the long drive back to Johannesburg.